2 posts categorized "Favorite Bookstores"
FATE OF THE ARTIST is not only far and away the release of the week but at this point in time, it's the release of the year, and, I think, the best book Campbell's released in about a decade. FATE OF THE ARTIST SC: Really should be reviewed in the trade section, but since First Second launched all six titles on the same weekend (and then nothing for another six months! Just like a real comic book company! Woot!) and Graeme's review said everything I would've said (and, of course, said it better) I might as well hit it here so I can review another First Second book in the Trade section. Fate Of The Artist is not only far and away the release of the week but at this point in time, it's the release of the year, and, I think, the best book Campbell's released in about a decade. When I first read the review copy a few months back, the book struck me as ineffably sad (although streaked through with rueful humor) as the artist prepares himself for his inevitable fate by ruminating on artists dead and forgotten, or remembered but not for their work, all while recounting his family's exasperated recollections of his absent-minded, pointlessly specific, self-amused artistic ways. I thought the book full of regrets that were twisted about, like ballon animals, in an effort to amuse. But rereading the book yesterday, what caught me was how deeply funny it was, starting with the hilariously bold conceit of composing a self-elegy--Lycidas as written by...Lycidas!--and moving on through all the funny anecdotes, pastiche comic strips, that damn dog Monty, etc. Through all of it, there's an appreciation of how funny life can be, even at its most frustrated and unfulfilled, and that appreciation is infectious, giving the work not only the most difficult of emotional victories, a love of life that feels genuine yet unsentimental, but also something unique--a comforting sense of dread. Finishing The Fate of The Artist, I realized that if I was lucky, I would get to deal with sorrows, regrets, fears, fights and alienation, and if I was smart, I'd look forward to all of it. As I said, it's the release of the week and quite possibly the year. Excellent work, and highly recommended. Just got back from San Francisco. Every time I go there, I feel like I leave it too soon. I was invited to join a panel of people from graphic novel publishing, which included editors from VIZ, Pantheon and First Second, as well as author/artists Jessica Abel, Matt Madden, and Derek Kirk Kim. We were faced off with another panel of major writers and developers from the videogame world, and the whole conference was centered on Visual Storytelling. This was sponsored by the San Francisco Academy of Art, and turned out to be most interesting. More to come about that adventure in coming blog entries. Before all that, we went to the legendary COMIC RELIEF bookstore in Berkeley. 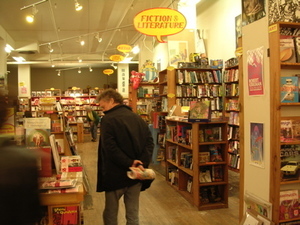 Now there's a bookstore to launch our 'favorite bookstores' category. It's a beauty, and stocked with thousands of the best graphic novels to be found. 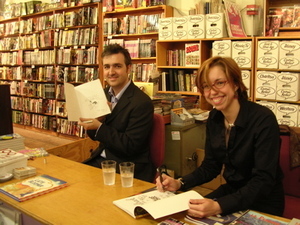 That evening Matt Madden and Jessica Abel were signing books. Did you get your copy of Matt's 99 WAYS TO TELL A STORY?